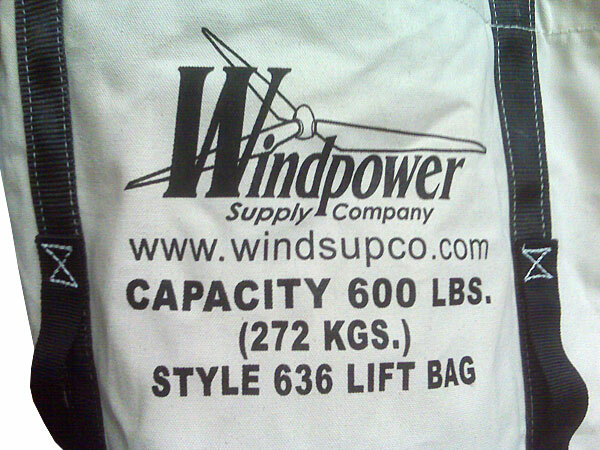 Our lifting bags are made of heavy weight canvas material for strength. The straps are made of 6,500 pound 2" Polyester and the D-rings are rated at 10,000 pounds each. The bag has a handle on two sides for easy maneuverability. The 34" bag is large enough to hold a Tractel Rescue device along with other tools to complete your task. Why use 4 small bags when this bag can handle it all? This bag is designed to go through platform accesses with ease while being lifted. The straps wrap completely under the bag and up the other side for added strength. There are four D-rings attached to the straps for lifting. All dimensions are approximate. These bags are made of heavy duty canvas material for strength. The straps are made of 6,500 pound 2" Polyester and the D-rings are rated at 10,000 pounds each. This bag is designed for use when a smaller bag will hold all of your tools. This bag is also easier to maneuver due to its small size. 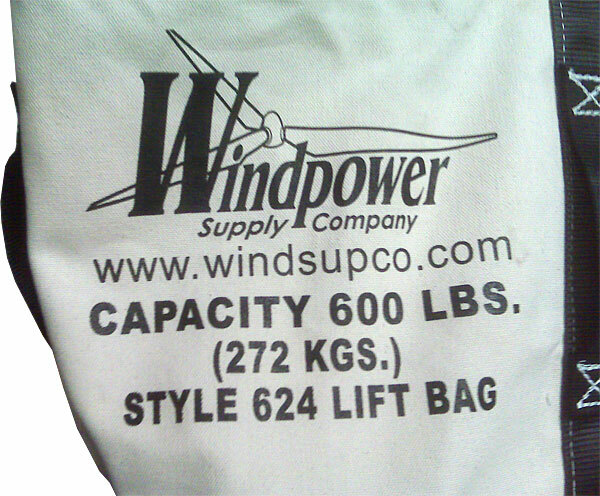 The Series 150 bag is ideal for use in smaller turbines where the chain hoist comes up the outside of the turbine and the bags have to be pulled inside. The strap wraps completely under the bag and up the other side for added strength. There are two D-rings attached to the straps for lifting. Dimensions are approximate. This bag is available in two styles, square and round. The round style is approximately 14" in diameter; the square style is 14" on a side. Both are 24" deep. This bag is made of a durable black marine fabric. It is ideal for carrying hand tools, radios, cell phones or other items while climbing. Call us for a discussion of your needs so we can provide you with prices.